Are you still looking for an easy treat to create for Cinco de Mayo? 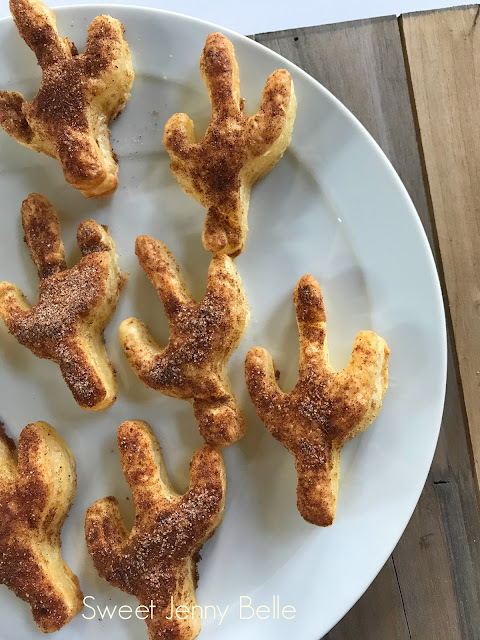 These cinnamon crisps are so easy that your kids could do most of the work. These treats take less than 30 minutes to make and will be a fun activity. They are delicious on their own - very similar to a churro or you could add on top of some fried vanilla ice cream. 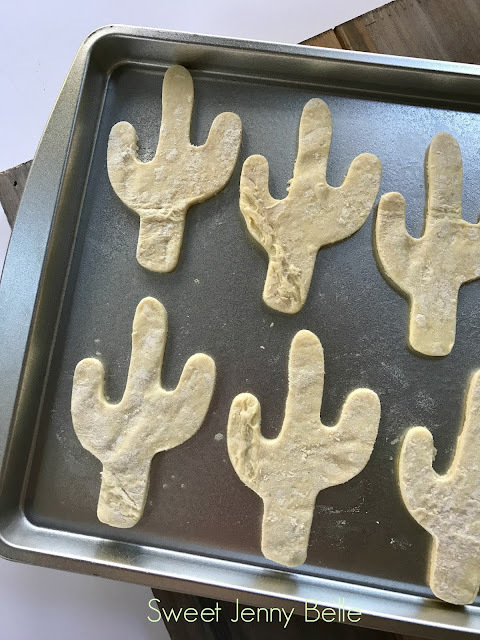 I created mine with a cactus cookie cutter - I always think of cacti when I think of Mexico. You could use whatever cutter that you have on hand or cut into strips. Yup, that's it! When I said this was a quick and easy treat, I meant it. Unroll one frozen puff pastry roll. Allow it to thaw at room temperature for 20 minutes. The pastry should be easy to work with, but still cool. Preheat the oven to 350 F.
Cut the pastry into your desired shape and place on a buttered pan. Bake for 8 minutes - the pastry will puff right up and be a beautiful golden shade. 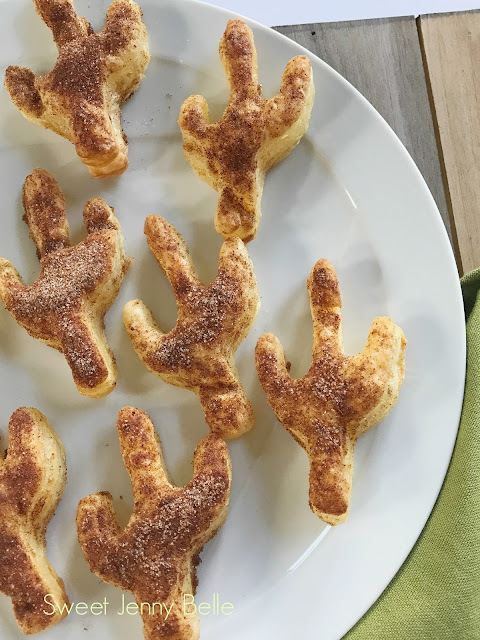 Dip or brush the pastry with melted butter and sprinkle on cinnamon sugar. Sit back and enjoy - so easy and yummy! Want to watch a quick little video on the process? Click the video box above and you'll see how fast your fiesta will be sweetened up! Don't forget to Pin this tutorial - it will be handy the next time you want to add a little something extra to your Taco Tuesday! 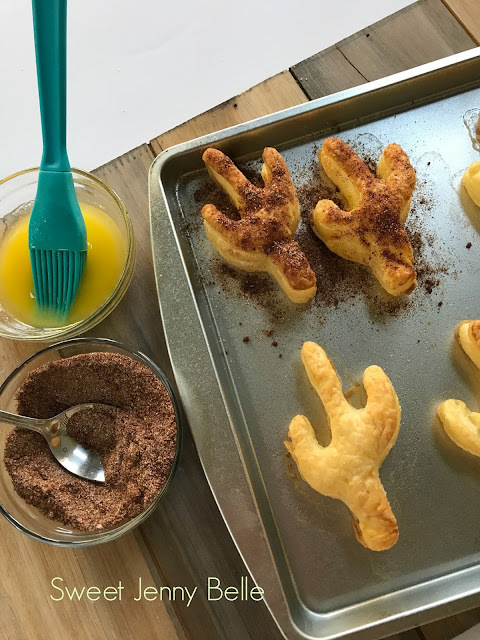 Did you want a traditional churro recipe? Come on over here for my recipe and some helpful tips!